"WELL MS, YOU NEED TO IMPROVE YOUR TEAM BOWLING, IT WAS VERY CLOSE IF AUSSIES WOULD HAVE WICKETS IN HAND THEY COULD HAVE TAKEN MATCH AS WELL AS SERIES WITH THEM.. YOUR BOWLERS ARE REALLY POOR!" 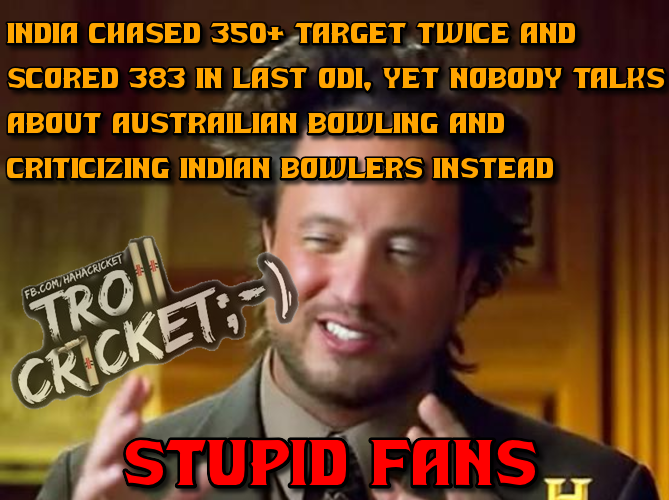 "YEAH WELL WE CHASED 350+ SCORES TWO TIMES IN THIS SERIES AND ALSO SCORED 383 TODAY AND NO ONE REALLY TALKED ABOUT AUSTRALIAS BOWLING! I AM NOT GOING TO BE UNFAIR WITH MY BOWLERS."